A booze-troubled man has been given a restraining order after he threatened to burn a former friend’s house down. 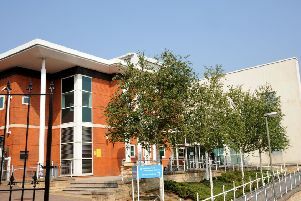 Chesterfield magistrates’ court heard on February 25 how Robert Reeve, 45, of Fletcher Street, Ripley, threatened his former friend after they had both made counter-claims that they had been assaulted by one another. Prosecuting solicitor John Cooper said the complainant had heard Reeve was going to arrange for his house to be burned down and that evening he claimed he saw Reeve clicking a lighter on-and-off before he told the complainant he was going to burn his house down. The complainant stated he believed his house would be burned down because Reeve’s relationship had broken down and the defendant had nothing to lose. Reeve also breached a restraining order after he went to his estranged wife’s home on Providence Street, Ripley, just days after he had threatened his former friend. The defendant pleaded guilty to making a threat from February 19, at Fletcher Street, Ripley, and admitted breaching his restraining order at Providence Street, Ripley, on February 23. Reeve told police he had gone to his estranged wife’s home to collect a spare key to his new home. He also claimed to police that his former friend had previously assaulted him but he had dropped the charges and he initially denied making any threats unless he had been drunk at the time. Defence solicitor Kevin Tomlinson said Reeve and his former friend had both made counter-claims alleging they had each been assaulted by the other. He added that Reeve may have said something which was passed on to the complainant but he had no recollection of repeating this in the street but he might have said something while he was drunk. Mr Tomlinson said Reeve never had any intention of going beyond any words spoken and he would not put his former friend or his family at risk of anything untoward. He explained that jobless Reeve is alcohol-dependent and is seeking help to bring this under control. Magistrates sentenced Reeve to an additional 12 month restraining order not to contact his former friend. He was also given a 12 month community order with a Rehabilitation Activity Requirement and a four-week curfew. Reeve must also pay £85 costs and an £85 victim surcharge. His original restraining order concerning his estranged wife is to continue until June 3, 2019.